Z Records continues its commitment to unearthing the obscure and long forgotten tracks from the last 40 years through the ever-popular Under The Influence series. It's now the turn of one of the scenes most prolific but yet unknown collectors, Winston. Outside of the established record collectors Winston is pretty much unknown but those that know of him will tell you that despite his low profile he has one of the best record collections around. Sean P remembers his first trip to Winston's house in the sleeve notes: "When I visited his house for the first time, I felt like a beginner -- my expectations were far exceeded by the neat rows and piles of 12"s and LPs everywhere; and I had brought along a foolscap notebook which after eight hours or so, expanded my wants list considerably. I thumbed through hundreds of weird and mysterious independent and major label releases. Winston played whatever I was interested in hearing, occasionally spinning random 7" ('Space Funk' by Manzel, for example) and various LP cuts of his choice. I had perused around half of the collection by the time I left, but I'll never forget that kid-in-a-toyshop feeling, along with the realization of Winston's buddha-like status as a master of this arcane pastime . . . Winston is still doing the 'rounds weekly; and since the Hammersmith Black Music Record events of the mid-80s, he's missed few record fairs, if any -- trading with dealers & fellow collectors and parting with cash when necessary. Surprisingly, he has no truck with the internet -- somewhat curious to the rest of us who now can't imagine life without it. And as a man with no online presence, knowledge of Winston's existence is restricted to the real world. Some justification, perhaps, for giving this fervent ambassador of all things boogie an opportunity to share some of his favorites beyond those in the know. 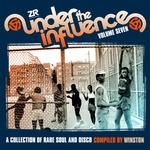 So for Volume Seven of the Under The Influence series Winston has included tracks taking in soul, funk, disco, and boogie with many of the tracks costing hundreds if you were able to find the originals." Double-CD version features: Mary Gold, Doug Payne & Polygon, Bollyn Thompson, Betty Padgett, Bilalian Creation, Expose, Lord Of Storm, Jungle Band, RG's All Nite Funk Band, T.T. Sotto, Bramsam, Jonnie Vibes Lambert, Synergy, Donnell Pitman, Al "Man" Muntzie and The Embraceables, Are & Be, Juice, The G.T. 's, Eklips, Ms. Victoria Barnes, The Olympics, Suave, and The Rappers.